Ultius.com is US based writing, editing, and proofreading company which has been working in this field since 2010. Despite the fact they are US based, since they are working online, their service is available to all students worldwide. Even though this company has very well developed webpage, it lacks a lot of very important information. For instance, clients cannot find anything related to the experience, education, and background of their writers. In addition, this company has several sample papers available on their website and these samples have an average quality and do not stand out from the other papers. Taking into consideration that the prices per page are not very affordable, clients should be aware that this company does not provide good price to quality ratio. Editing services – This group of services covers: proofreading, rewriting, copyediting, formatting, dissertation editing, and essay editing. Business writing service – This services group covers resume, CV, cover letter, college admission, and business plan preparation and writing. 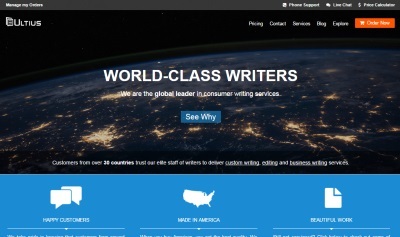 Despite the fact that this company developed its offer to the smallest details, the pricing table is not so all inclusive and it has two main groups of prices – academic writing and business writing. It does not give any information regarding to the editing services. In addition, pricing table is just an estimation of costs so clients should place the order to be able to have the final calculation of their costs. This service is not the cheapest in the market, and there are many others with more affordable prices and better quality. Price is calculated on per page basis and it depends on three factors – number of pages, deadline and academic level. Depending on the type of order, deadlines for academic writing can go from 3 hours to 20 days, whereas papers are written on 4 academic levels – high school, undergraduate, Master’s and doctoral. Deadlines for business writing go from 8 hours to 7 days. The second parameter that influences price is paper type, and this service includes CV, Resume and Cover letter writing. All in all, prices for academic writing goes from $17.00 (high school paper with 20 days deadline) to $60 (Master’s paper with 3 hours deadline). Business writing costs more, and the cheapest is Cover letter writing. Its prices go from $25 per page (7 days deadline) to $95.00 (8 hours deadline). CV writing is the most expensive and its prices go from $90.00 (7 days deadline) to $170.00 (8 hours deadline). There are no available information regarding to the discounts or additional features. This company has 24/7 available customer support team that can be contacted via telephone, online chat or email.